I love food! I mean… who doesn’t? But it was only about a year ago (where have I been all this time!?) that I discovered food tours and I now try and do at least one wherever I go. Of course, Valencia, the capital of paella, wasn’t going to be an exception, even though I’ve been here many times before. In fact, all the more reason to do one! 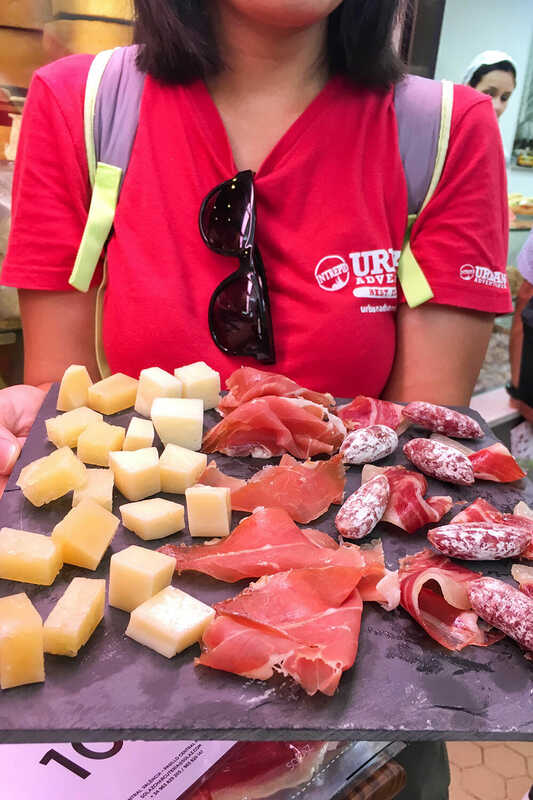 So for my Valencia food tour I chose the Treats and Tastes tour with Valencia Urban Adventures, and I couldn’t be happier with my choice. They are part of the Intrepid Travel group, which is well known for responsible travel and adventure. I arrived at Mercado Colón to meet Lenny, the tour host, who was wearing the distinctive Urban Adventures red t-shirt with the tag line: Best. Day. Ever. ‘This looks promising’ I thought. I was joined by a Colombian family of four, and after some brief introductions we headed for the ultimate Valencian mid-morning snack, an horchata de chufa. The horchata is a refreshing creamy white drink made from chufas (tiger nuts). It is a little bit similar to almond milk but slightly sweeter. It is usually accompanied by a fartón, a light sweet pastry stick that is dipped into the horchata. Delicious! 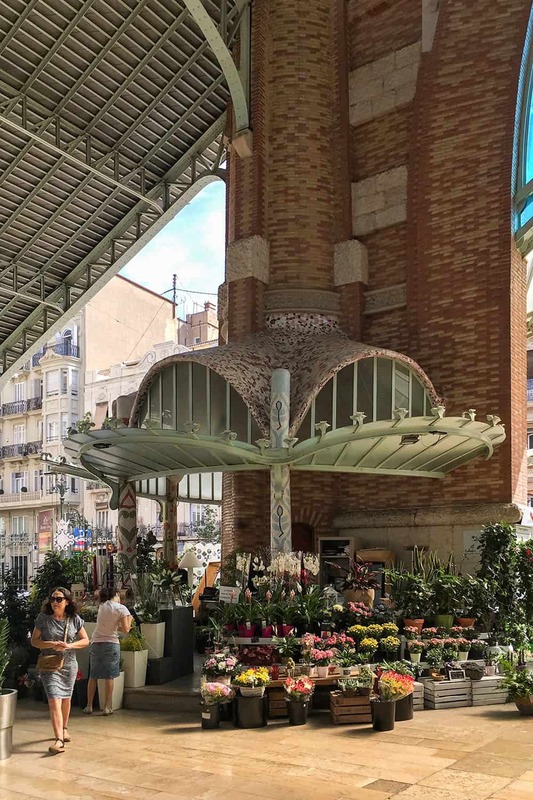 After we all savoured our first treat, we had a walk around the Mercado Colón, one of the most emblematic Modernist buildings in Valencia, while Lenny explained that it used to be the 2nd public food market in the city. It is located in a now very affluent area of the city, and over time, the need for a fresh food market in the neighbourhood changed and the building fell into disrepair. After a long renovation project, in 2003 it was given a new lease of life as a gastro market with lots of upmarket international bars and restaurants. As we walked to our next stop, Lenny explained that Valencians can have five meals a day… Five! First is desayuno (breakfast), which tends to be toast with tomato and olive oil, or a sweet pastry like a fartón or similar. Then comes the almuerzo, what we know in the UK as ‘elevenses’, around 10.30-11am which consists of a bocadillo (similar to a baguette sandwich) of tortilla (Spanish omelette), calamares (calamari), jamón (cured ham) or something along those lines. This is sometimes accompanied by a beer. Comida (lunch) is the main meal of the day around 2pm, and it’s normally paella or another rice dish. Meal number 4 is the merienda (afternoon tea), usually a horchata de chufa with a fartón or a pastry with a smoothie. And the final meal of the day is cena (dinner), which tends to consist of tapas. 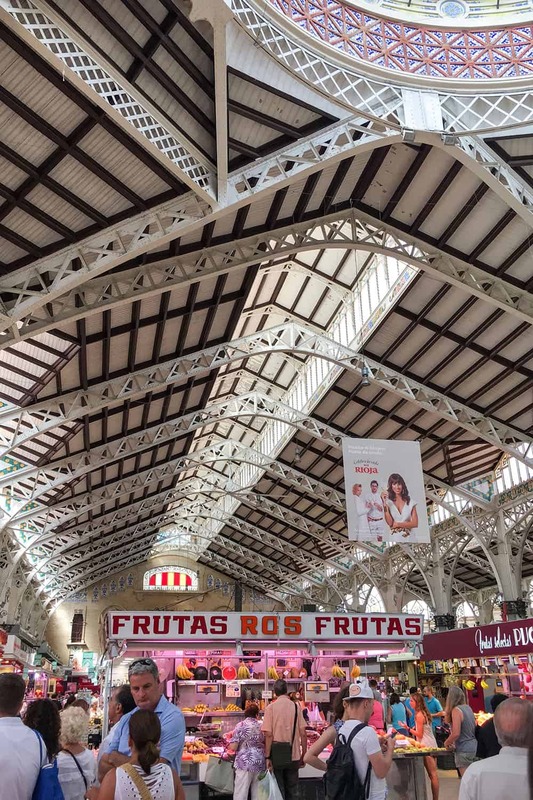 Our next stop was the famous Mercado Central (Central Market), said to be one of the most beautiful market halls in Europe. 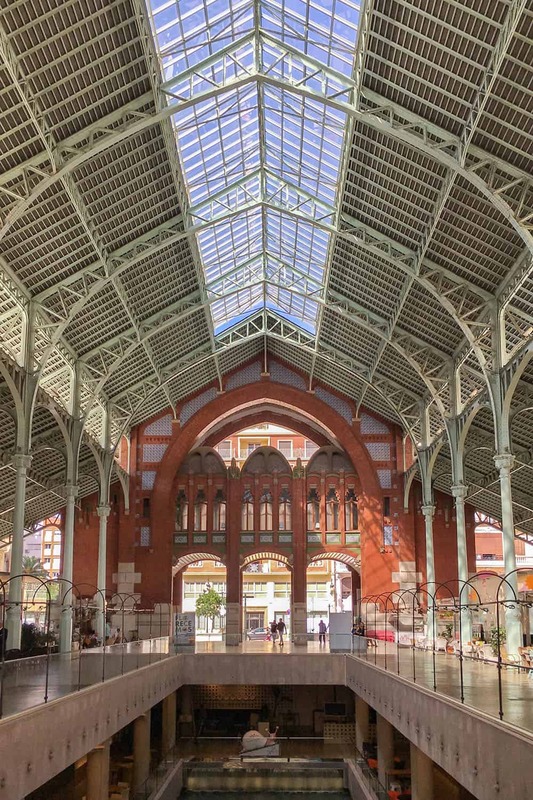 It is housed within a modernist building from the 1920s and is a must-see attraction for anyone, foodie or non-foodie, visiting Valencia. 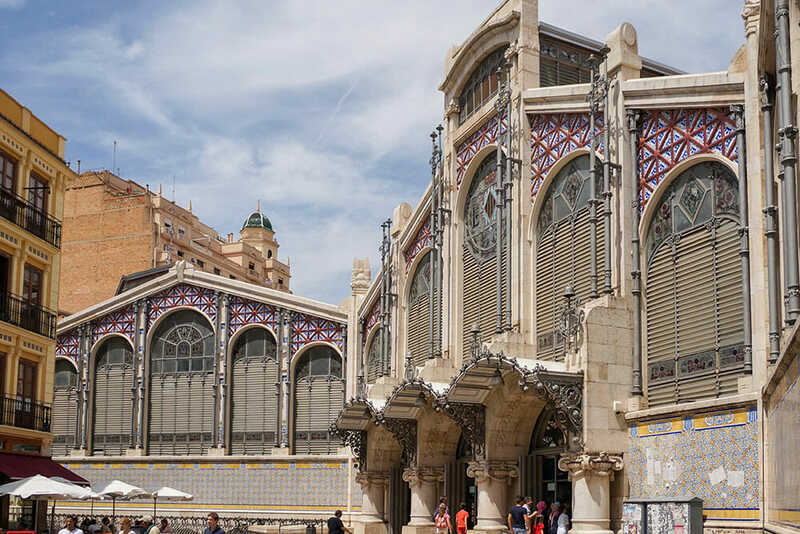 Despite being really popular with visitors to the city, it is still a neighbourhood market, where you can observe every day local life, and sample the best produce that the Valencian region can offer. It is certainly one of my favourite spots in the city! At the market, Lenny took us to a traditional stall that specialises in the best quality Spanish azafrán (saffron), where we learnt how to differentiate between 1st and 2nd quality saffron. Did you know that you need around 150 flowers to get 1g of saffron? Harvest and selection is a very manual process, which is why it is the most expensive spice in the world! We then walked to the next stall, which specialised in cured meats. 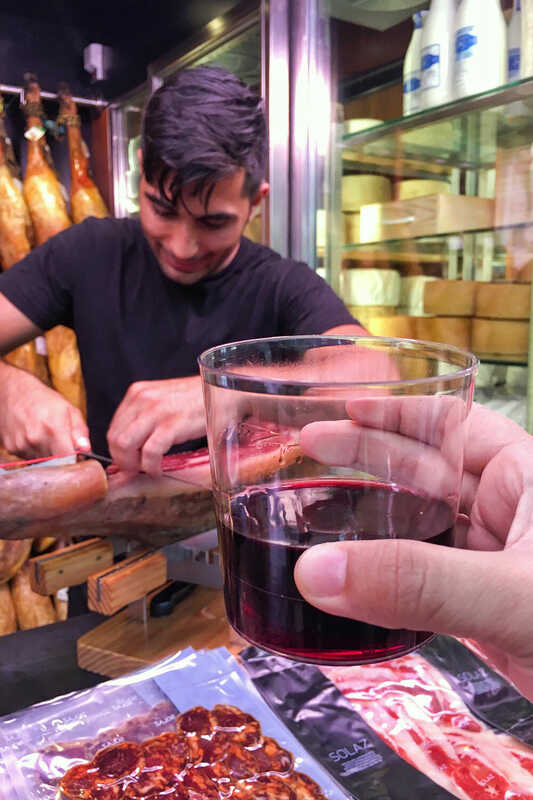 Here we learnt about the differences between jamón serrano and jamón ibérico, while we enjoyed some samples, which also included fuet (a thin, dry cured sausage) and two types of manchego cheese (one young and one mature). All this was washed down with a nice glass of red wine. Jamón serrano comes from ordinary white pigs. The leg is covered with salt and cured for a period of between 6 months and 1 year. Jamón ibérico has a similar curing process but it is done over 3 years. It comes from pata negra (black Iberian) pigs, which roam free on oak groves where they feed naturally on grass and acorns. 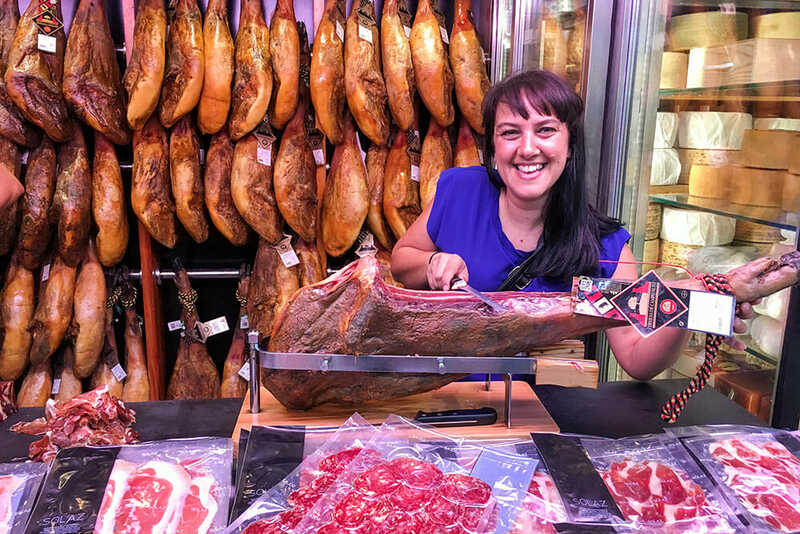 Jamón ibérico is fattier and more flavoursome than serrano, and the fat just melts in your mouth. Being a meat eater, this was without a doubt my favourite stop of the day. A pro in the making! On our way to the next stop, Lenny encouraged us to pop inside the Central Post Office and wow! What a treat for the eyes that was with its incredibly beautiful domed glass ceiling! We continued on to a sweet (literally) little chocolate shop, that has been making chocolates in Valencia since the 1930s and it’s famous for its chocolate truffles and its cubanitos. And now I understand why it’s so famous! The chocolate is just divine! It has nothing to envy Belgian or Swiss chocolate at all! From here, we went to Russafa Market, in the neighbourhood of the same name. Russafa has become the hipster area of Valencia, but the market has remained a great place to observe local every day life. 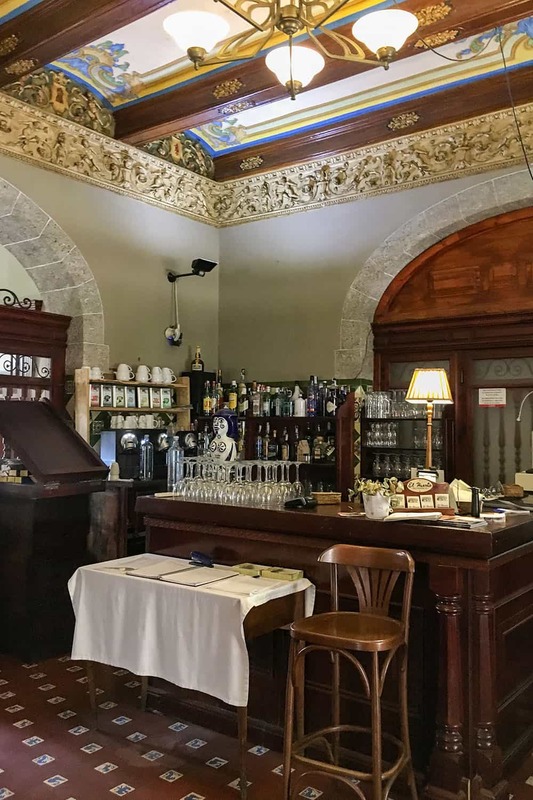 Here, Lenny took us to a little shop that specialises in olive oil, where we learnt about the different grades of oil, extra virgin and virgin olive oil through a tasting session. We were also given some samples of black (ripe) olive and green (unripe) olive tapenade and piquillo peppers jam, which were really tasty! 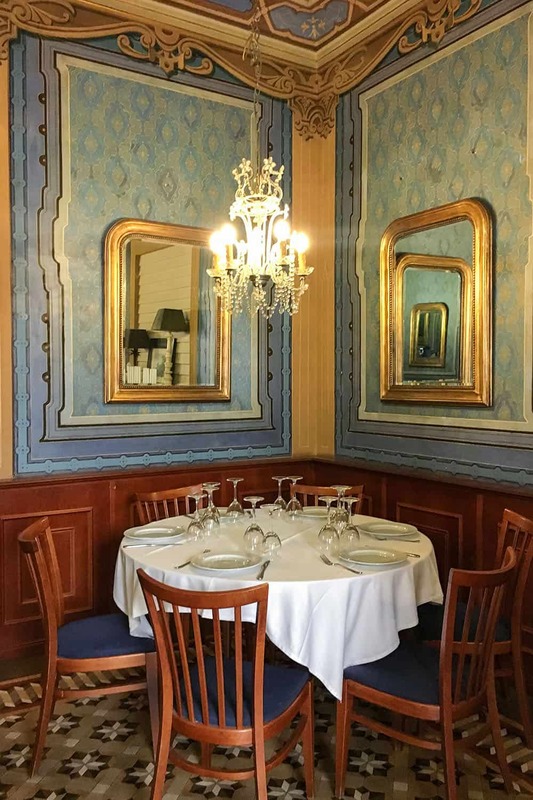 Our last stop was a historic restaurant located within a Valencian traditional house built at the beginning of the 19th century, still with a lot of gorgeous original features. 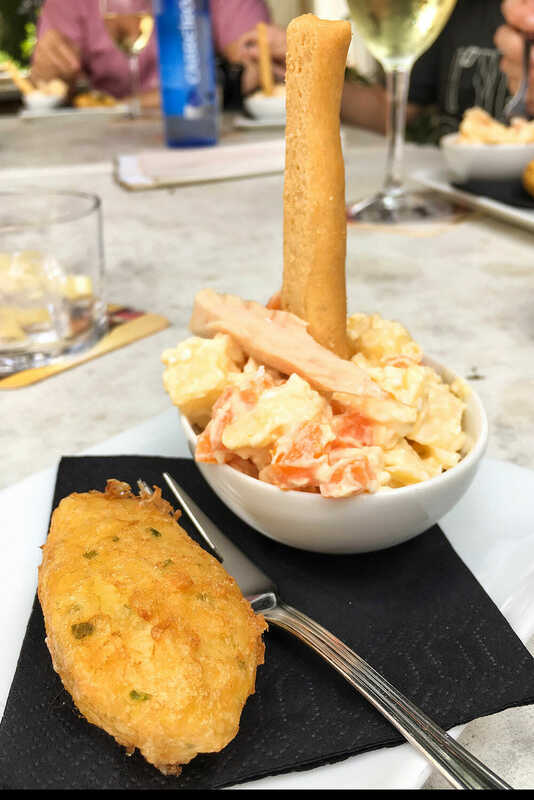 As it was a lovely day, we sat outside and we were treated to two tapas here: ensaladilla rusa, literally translated as Russian salad, it is a Spanish-style potato salad, and a cod croquette. The perfect ending to the tour! I loved this tour not only because Lenny is an excellent host, but because of all the information I learnt from her – all the different grades of the products we tried and the process they go through before they end as the final product. And let’s not forget about the treats themselves! Absolutely delicious! So the original promise was definitely delivered… Best. Day. Ever. Practical information: You can book this tour for yourself on the Valencia Urban Adventures site, and receive a 15% discount by quoting my special discount code ‘15BROGAN’. And if you do go ahead and book this tour, say hello to Lenny from me! So tell me: Which of these foods would you like to try the most? Disclosure: A big thank you to Lenny from Valencia Urban Adventures, who hosted me on this tour. As always, all views are my own. This post also contains affiliate links, that earn me a small commission but come at no extra cost to you. Thanks as always for your support! This looks incredible! I love food tours and food markets and taking pictures and eating and yum yum yum! We took this tour with Lenny last year! What an amazing experience. She’s so knowledgeable about Valencia and its food culture. We bought so many goodies from Russafa Market. What was your favorite horchata? Hola Eulanda & Omo! You are too kind 🙂 I am glad you both still remember the good tour experience with me and its our wonderful local vendors that get all the credit! Hopefully i’ll see you both back soon! Oh my gosh! Your pictures speak so much! Loving them, especially that dome in the Post Office – so stunning. What wonderful photos, they’re certainly making my mouth water! I could definitely get used to having 5 meals a day. Like you, I have recently discovered food tours as well – I’m planning to do one in Belfast when I go in November – they’re such a good way to gain an alternative understanding of the culture. A very interesting read, the tiger nut drink and farton sound nice for breakfast but then all of it sounds scrummy! Oh gosh, it all looks so good! I’ve never actually been on an organized food tour and I feel like I’ve been really missing out! Were there any places you visited that you would have visited again? We did this tour on Oct last year and loved it and Lenny as well. Thanks so much for capturing this on your blog so perfectly. I am editing our photos and video now (yes a year later!) and your blog post helped to label the different places on this tour. Thanks Jo. I’m really happy you enjoyed my post and the actual tour too. Lenny is awesome!